Gearing up to celebrate a monumental birthday is likely different for everyone. Some people plan lavish parties with lots of excitement, but for me, there was a lot of crying, panic, and anxiety. When I found myself with a work-free day on my 30th, I decided to make the best of it and celebrate WDW style! If you have to turn 30, you might as well turn 30 at Disney’s Polynesian Resort, right? A few days prior, I made a reservation for myself at Kona Cafe, and promptly sent an e-mail to the WDW Special Diets team (thank you Disney Hipsters Adam and Andrew for the advice!). You see, I had heard tell of vegan Tonga Toast. Though I had never had traditional Tonga Toast, I figured: if there’s any way to celebrate a birthday, it’s with vegan deep fried bread and cinnamon, so I might as well give it a whirl! I received a reply from WDW Special Diets the day following my request. They assured me it wouldn’t be a problem, and to just notify the host or hostess that I had spoken with them. Bingo bango, right? I can’t say I wasn’t skeptical, or preparing myself for potential disappointment, but I figured if nothing else, there was Kona coffee in it for me, so it would be a win/win either way! When I arrived, it was like they had all been waiting for me! Mind you, there were only two other families eating breakfast at 11am on a Monday at Kona Cafe, but everyone was so welcoming and courteous (heck no, I didn’t tell them it was my birthday, are you crazy?!). My server, who was just the nicest young man (I can start calling people “young man” now that I’m 30), immediately got the chef (also a nice young man). Since my e-mail to Special Diets had detailed that I was specifically hoping for vegan Tonga Toast, the chef knew exactly what I had come for and let me know it wouldn’t be a problem. He said it would take just a few extra minutes to change the oil. Take as long as you want, buddy, just bring on the Toast! As I sat consuming an entire pressed pot of Kona coffee, the most wonderful looking breakfast food item I had ever seen was placed before me. Ladies and gentlemen, it was French Toast, it was as big as my head, there were bananas inside, and a little cup with a spout filled with some magical strawberry concoction. Was this heaven? I think it was. A delicious, cinnamon sugar heaven. It was extremely filling, but so good that I wanted to keep eating forever. The strawberry compote was the perfect compliment to the French Toast. Maple syrup, maple schmyrup. I managed to eat about half of my portion, leaving all of the poor side-of-fruit to get packed up to go along with the second half of my toasty breakfast. I ate the second half secretly, in small spaced out bites throughout the day. This was so filling I didn’t have an appetite for anything else the rest of the day. Don’t forget about the entire pressed pot of coffee just for me, but still! This has to be one of my all-time favorite meals I have ever eaten at WDW. I promise, I am not exaggerating. If you find yourself seeking out an amazing vegan breakfast or early lunch option, please be sure to contact Special Diets ahead of time so the chef can be prepared to make you this amazing meal. Also, if you’re going, make the reservation for one extra person and invite me, ok? Tonga Toast has always and will always be my favorite breakfast at WDW. First time down we traveled to Port Orleans Riverside for it. Didn’t know they had it at Kona Café. Now it is always at Kona, specially because you get that wonderful coffee and juice. 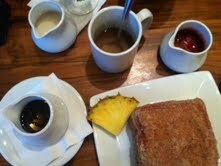 I highly recommend anyone who has not had it go to Kona café toady and order the Tonga Toast. I celebrated my 30th at Disney as well! It was more years ago than I care to mention, but I recall it really took the sting out. The tonga toast sounds amazing, do you know what was used in the place of the egg and milk mixture? Or is it not the same as french toast? As many times as I’ve been to Disney, never found my self near the Poly for breakfast. I’ll definitely ask next time I go back for more (very, very soon) and let you know! I would definitely recommend giving Kona for breakfast a try! This sounds awesome! Breakfast seems to be the only vegan meal really hard to find at Disney, I can’t wait to try this! As far as vegan french toast in general goes, I’ve used a flour, nutritional yeast, and black salt mix with rice milk and vanilla to make a really good home version. The nutritional yeast and black salt give it a great eggy flavor. 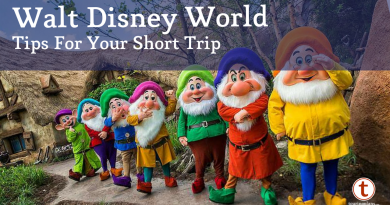 I will also be celebrating my 30th in the Happiest Place on Earth…I will have to start making some fun food plans ahead of time for our October trip! It’s the only way to celebrate 30! Love your references to the “young men” who served you your amazing breakfast, by the way 😉 I am thinking you may have a second career as a vegan tour guide of WDW. You could host progressive dinners/lunches/breakfasts/all day long food fests for vegans or other special diet seekers. I’m not kidding! This looks great! We eat breakfast at Kona at least 2-3x each trip b/c I know I can get vegan Mickey waffles or a veg stir fry. Now I will have to ask to try the Tonga Toast! Would be great to have a webpage or app, something you could continually update with vegan options at Disney. That’s a really good idea! I really hope you enjoy the Tonga Toast when you visit! Great minds think alike in toast! I have lunch reservations for Kona Cafe. Hmm. Maybe I should make reservations for breakfast. But also heard you can get Tonga Toast at Captain Cooks, which is counter service. I wonder if Captain Cooks would also make the vegan version. I’ll have to investigate! I would highly recommend breakfast at Kona. Definitely. Just made reserverations for Kona at 7:30. Since staying at POFQ, will have to drive to TTC. That’s okay. I can walk to Poly for meal and use Monorail/Ferry to MK and back. Decided on Captain Cooks for lunch instead.